Anxiety is a psychological state that is characterized by exaggerated and persistent feelings of worry, tension, and nervousness, even when there is nothing apparent to provoke these feelings. On average, anxiety disorders affect more than 25 million Americans. These anxiety disorders include generalized anxiety disorder, panic disorder, social phobia, post-traumatic stress disorder, and obsessive compulsive disorder. Women are twice as likely to suffer from anxiety as men. There are numerous natural treatments for easing anxiety. It is important to know the causes of anxiety disorders in order to properly treat them. In many women, the cause is hormone fluctuations experienced during menstruation, pregnancy, and menopause. Other factors that can trigger anxiety symptoms include high stress (either at work or at home), genetics, certain medications, emotional trauma, lack of exercise, and poor diet. 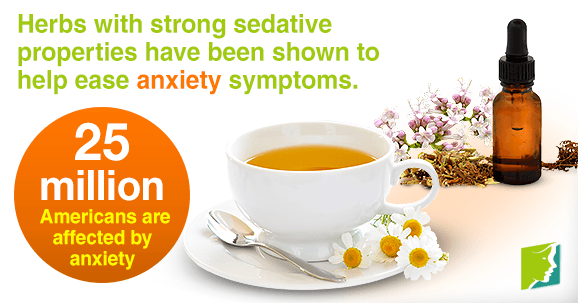 Herbal remedies are a low-risk and economical method that can help reduce anxiety symptoms. Making simple lifestyle changes has also been shown to help ease anxiety. Herbs with strong sedative properties have been shown to help ease anxiety symptoms, calm the nerves, and soothe restlessness and nervousness. Chamomile, lavender, and valerian are all calming, sedative herbs that are widely used for treating anxiety disorders. These herbs may be taken in supplement or extract form, (i.e., capsules, teas, tinctures), or you can add these essential oils to a warm bath. The most effective way to reduce stress and release “feel-good” neurotransmitters, like serotonin, is to exercise regularly. This means at least 30 minutes of aerobic activity daily, five times a week. Exercising can also significantly increase energy levels, lift mood, and improve the efficiency of the heart, lungs, and muscles. Walking, cycling, and swimming are all good forms of low-impact workouts that can help ease anxiety. Don't skip meals! This is crucial for preventing anxiety symptoms, like irritability and headaches. Making simple dietary changes can be extremely helpful in reducing anxiety symptoms. Try including protein, fiber, omega 3 fatty-acids, and fruits and vegetables into meals for maximum energy. Salmon, spinach, and low-fat yogurt are all healthy foods that have been known to help ease anxiety. Taking time every day for yourself is vital for feeling good and treating anxiety. Taking a yoga class, a soothing bath, reading, or meditating are all effective ways to relax the body and mind. Try breathing exercises and letting go of the day's pressures and worries. Talking to close friends and family can help you relax and release tension. Try to make time to see friends and family throughout the week, or at least to give them a call. Having a solid support system is vital to your mental health. Anxiety can be a troublesome symptom that can interfere with your ability to carry out every day activities. On average, anxiety affects 25 million Americans. There are many natural treatment options that have been shown to be beneficial, and are also cost-effective and easy to do. It is important to try to find the treatment options that works best for you. If the featured natural treatment options do not work, it may be time to talk to your healthcare provider about talking to a psychologist.